For hundreds of years, city planners have developed parks, planted trees and set aside open space in urban environments. Boston Common, a public square used for grazing livestock since 1634, was converted into a park in 1830. A quarter of a century later, New York’s Central Park opened, designed by Frederick Law Olmsted and Calvert Vaux. Olmsted, originally a journalist by trade, went on to develop parks throughout the United States, including in Wisconsin, Colorado, Washington, Georgia and the District of Columbia. The terms “urban greenery,” “green space” and “open space” all refer to urban design elements meant for recreation or improving a neighborhood’s aesthetic appeal — trees and other plants in parks, sidewalks or elsewhere; public plazas, schoolyards and playgrounds; and public lands covered with trees, shrubs and grass. Such projects can also function as “green infrastructure,” helping mitigate the urban heat island effect, filtering air and reducing runoff. A 2008 study of low-income Philadelphia neighborhoods even found that newly planted trees boosted sale prices of nearby houses by 2%. 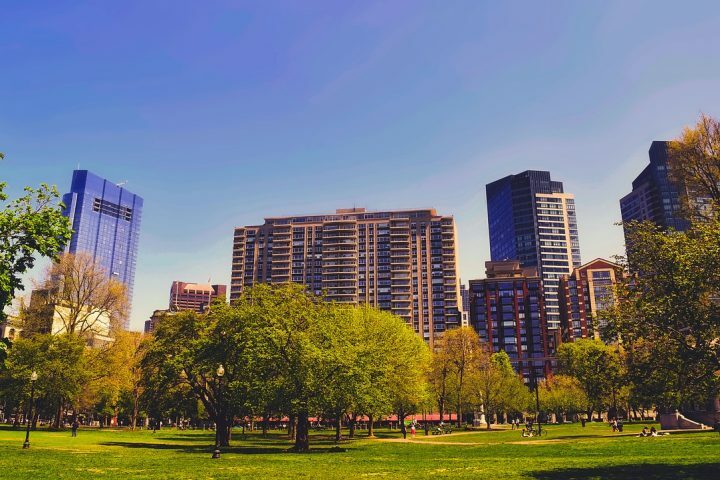 In recent years growth has returned to U.S. city centers, and many municipalities have shown a renewed interest in incorporating green space and vegetation into the urban environment. In 2011 New York City opened the High Line, an elevated linear park converted from an abandoned rail line, while cities as diverse as Los Angeles, Denver and Miami have launched campaigns to plant 1 million trees. The distribution of green space often reflects the economic makeup of neighborhoods, however: A 2013 investigation by the Washington Post found that wealthier areas of the District of Columbia had an 81% average tree-cover rating, while lower income areas averaged only 48% coverage. To counter the shortage of vegetation in poorer neighborhoods, Philadelphia began a program to convert vacant lots into publicly accessible green spaces. A 2010 meta-analysis in BMC Public Health have found that, compared to walking or running in “synthetic environments,” doing so in green spaces led to decreased anger, fatigue and feelings of depression in addition to increased attention levels. (However, many were short-term studies involving mainly college students, and did not assess health outcomes.) A 2008 study by Australian researchers and 2010 research in the Journal of Public Health explored the relationship between green space, social contacts and health benefits. Dadvand, Payam; et al. Proceeds of the National Academy of Sciences, May 2015, Vol. 112, No. 26. doi: 10.1073/pnas.1503402112. Cohen-Cline, Hannah; Turkheimer, Eric; Duncan, Glen E. Journal of Epidemiology and Community Health, 2015, 69:523-529. doi: 10.1136/jech-2014-204667. Lee, A.C.K. ; Maheswaran, R. Journal of Public Health, 2010. Vol. 33, Issue 2. doi: 10.1093/pubmed/fdq068. Russel, Roly; et al. Annual Review of Environment and Resources, 2013, Vol. 38. doi: 10.1146/annurev-environ-012312-110838. Bowler, Diana; Buyung-Ali, Lisette; Knight, Teri; Pullin, Andrew. BMC Public Health, 2010, Vol. 10, Issue 456. doi: 10.1186/1471-2458-10-456. Hystad, Perry; et al. Environmental Health Perspectives, 2014. doi: 10.1289/ehp.1308049. Jesdale, Bill M.; Morello-Frosch, Rachel; Cushing, Lara. Environmental Health Perspectives, July 2013, Vol. 121, Issue 7. doi: 10.1289/ehp.1205919. White, Mathew; Alcock, Ian; Wheeler, Benedict; Depledge, Michael. Psychological Science, 2013, Vol. 24, Issue 6. doi: 10.1177/0956797612464659. Mitchell, Richard; Popham, Frank. The Lancet, November 2008. Vol. 372, Issue 9650. doi: 10.1016/S0140-6736(08)61689-X. Branas, Charles C.; et al. American Journal of Epidemiology, 2011, Vol. 174, Issue 11. doi: 10.1093/aje/kwr273.